However, owing to their different orbital periods, a year on Mars is significantly longer than a year on Earth – almost twice as long, in fact. And because their orbits are different, the distance between our two planets varies considerably. Basically, every two years Earth and Mars will go from being "at conjunction" (where they are farther from each other) to being "at opposition" (where they are closer to each other). In other words, a Martian year is almost 700 days long, which works out to being 1.88 times as long as a year on Earth. 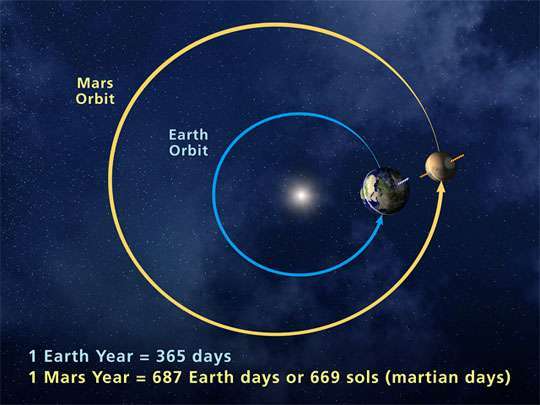 This means that every time Mars completes a single orbit around the sun, the Earth has gone around almost twice. During the moments when they are on opposite sides of the sun, this is known as a "conjunction." When they are on the same side of the sun, they are at "opposition." By definition, a "Mars opposition" occurs when planet Earth passes in between the sun and planet Mars. The term refers to the fact that Mars and the sun appear on opposite sides of the sky. Because of their orbits, Mars oppositions happens about every 2 years and 2 months – 779.94 Earth days to be precise. From our perspective here on Earth, Mars appears to be rising in the east just as the sun sets in the west. After staying up in the sky for the entire night, Mars then sets in the west just as the sun begins to rise in the east. During an opposition, Mars becomes one of the brightest objects in the night sky, and is easy to see with the naked eye. Through small telescopes, it will appear as a large and bright object. Through larger telescopes, Mars' surface features will even become apparent, which would include its polar ice caps. 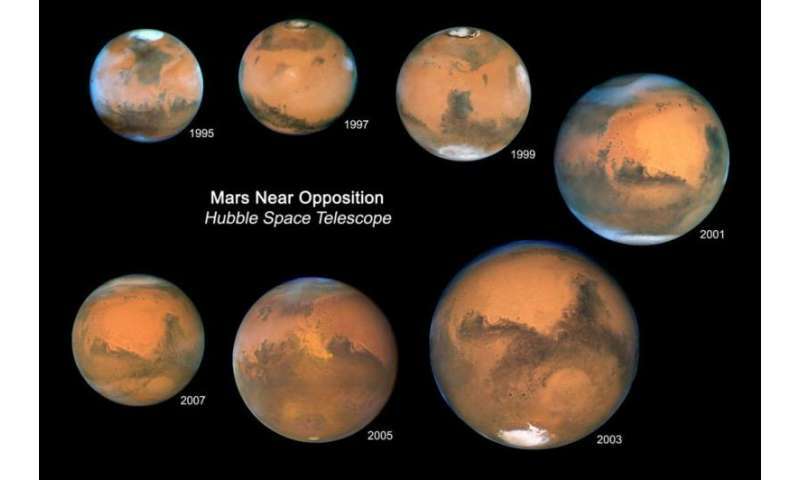 An opposition can also occur anywhere along Mars' orbit. However, opposition does not necessary mean that the two planets are at their closest overall. In truth, it just means that they are are at their closest point to each other within their current orbital period. If Earth and Mars' orbits were perfectly circular, they would be closest to each other whenever they were at opposition. Instead, their orbits are elliptical, and Mars' orbit is more elliptical than Earth's – which means the difference between their respective perihelion and aphelion is greater. Gravitational tugging from other planets constantly changes the shape of our orbits too – with Jupiter pulling on Mars and Venus and Mercury affecting Earth. Lastly, Earth and Mars do not orbit the sun on the exact same plane – i.e. their orbits are slightly tilted relative to each other. Because of this, Mars and Earth become closest to each other only over the long-term. 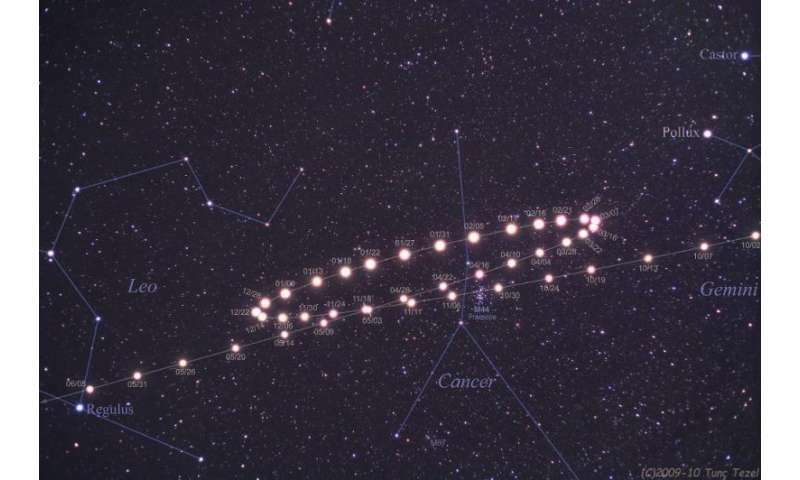 For instance, every 15 or 17 years, an opposition will occur within a few weeks of Mars' perihelion. When it happens while the Mars is closest to the sun (called "perihelic opposition"), Mars and Earth get particularly close. And yet, the closest approaches between the two planets only take place over the course of centuries, and some are always closer than others. 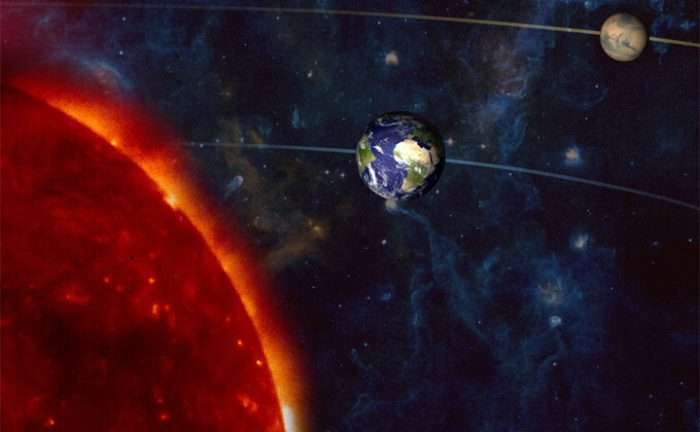 To make matters even more confusing, over the past few centuries, Mars' orbit has been getting more and more elongated, carrying the planet even nearer to the sun at perihelion and even farther away at aphelion. So future perihelic oppositions will bring Earth and Mars even closer. There's a reason missions to Mars depart from Earth every two years. Seeking to take advantage of shorter travel times, rovers, orbiters and landers are launched to coincide with Mars being at opposition. And when it comes time to send crewed mission to Mars (or even settlers) the same timing will apply! Good article, although there is a minor typo here: "(3,464,648 mi; 0.37272 AU)." It is a good bet the first crewed mission to Mars will encompass two perihelic oppositions to minimize the time the astronauts are exposed to radiation in interplanetary space, etc. I understand this is why the 2033 opposition is the working target date used by NASA. The fact that this happens to roughly coincide with a solar minimum helps too. In comparison, the Mars One folks previously said they want to go in 2027, which I find telling. I understand the Mars opposition of 2027 is the furthest of all oppositions of the 21st century, so they could not have picked a worse opposition.